Veronica Burton pulls up for a jumper. The freshman guard made NU’s only three of the night. For the second straight game, Veronica Burton hit a seemingly-impossible half-court shot to close out the third quarter on Thursday. But this time, the freshman guard’s heroics were unable to spark a Northwestern comeback. Ultimately, Minnesota’s (14-7, 3-7 Big Ten) defense proved too strong for the Wildcats (13-8, 6-4), as that 3-pointer would be the only shot the team would make from beyond the arc in 40 minutes of play in the 61-54 loss. NU shot just 14.3 percent from three and 37.7 percent from the field, nearly three percentage points below the season average of 40.3 percent. 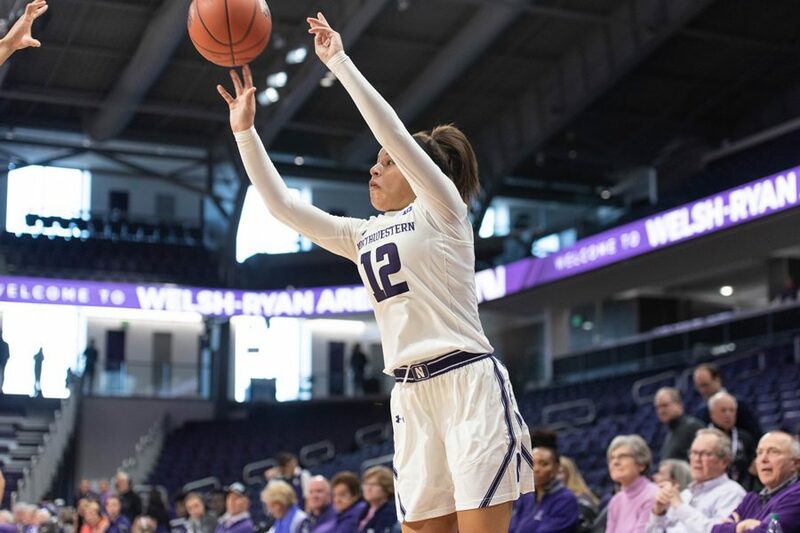 The Cats made mistakes with the ball in their hands and also releasing it out of their hands, as the turnovers and missed shots on the perimeter were too much for NU to overcome. In addition, while NU doesn’t rely heavily on the 3-pointer, the Cats attempted a season-low seven from beyond the arc, partly due to Minnesota’s pressure. Coach Joe McKeown also emphasized the team’s struggles shooting from three, noting the Golden Gophers were quick at getting back on defense and preventing open opportunities in transition. The significant pressure on sophomore guards Jordan Hamilton and Lindsey Pulliam as well as Burton, he said, prevented the team’s main perimeter threats from getting open shots. The other main issue McKeown emphasized was the lack of “sharp and crisp” passes, which he said could be attributed to Minnesota’s overall quickness. The Cats finished with only nine assists on the game, relying on Pulliam to create off the dribble instead. She finished 4-for-15 from the field, and she took most of her shots off the bounce instead of moving the ball. Moving forward, the Cats have a quick turnaround, hosting Ohio State on Sunday at Welsh-Ryan Arena. Calling this game a “hiccup,” McKeown said the team needs to make offensive adjustments to ensure a performance similar to this doesn’t repeat itself against one of the best programs in the conference. With six teams within one win of each other in the middle conference standings, one game like this can have a massive impact on NU’s conference and NCAA aspirations. Nevertheless, McKeown said the team can make the necessary adjustments after this loss to prevent the Cats from falling any further in the standings.